A really good friend of mine just bought the farm, his words not mine. He purchased his Great Gran-daddies farm in western North Carolina at the foot of the Blue Ridge mountains, surely the land of the Southern Gods if that place could be marked on any map. Greg is a bit of a Southern God himself, or at least a bit Clark Kent/Superman like in his daily life. He is an amazing writer, loves dogs, puts on his long white coat and bow-tie and becomes Dr. P, because he is a Pediatrician at Vanderbilt, lobbies in Washington on behalf of literacy for children and he cooks. Every time we talk I find some new bit of astonishing information about him that puts ME right in the category of under-achiever. He also would be totally embarrassed that I wrote this about him, he is humble and never talks about his accomplishments. I am so HAPPY for him I can hardly stand it, he deserves all the goodness that life in those mountains can bring his way, fresh air, a view of those beautiful mountains from the front porch that his Gran-daddy built by hand, and the ease of mind that the very dirt your ancestors plowed for a hundred years is under your feet. That dirt in those mountains calls me back. I know its called to him for years. Oddly enough, Greg and I grew up pretty much in the same place.We didn’t know each other then, we met at a writers meeting in East Nashville hosted by some people who became wonderful friends from Portland Oregon. I had taken my little manuscript to this meeting and said it was fiction, because quiet frankly as a non-writer I didn’t even know how to categorize it. Greg outed me. He knew the places I knew, Spindale, and Rutherfordton. The mill store at Stonecutter Mills where my Granny would go at least one day each week to buy fabric remnants, to make clothes and curtains and quilts out of. He knew the Spindale House and the uptown streets of Forest City where once upon a time I rode the Christmas float in my red velvet coat and white fur muff for WAGY radio station, where Daddy worked. So my little manuscript became creative non-fiction. And Greg became my friend and one of the best critics of my work I have ever met, as a writer you gotta’ have a good critic. Greg also likes my cooking, to which I am grateful. His taste buds are much like mine. I talked to him about Livermush one time and he said his family made their own because they were too poor to buy it, which is remarkable because I think you can still buy it for about $1.59 a loaf. If you’ve never had it, I can’t possibly get you to understand how really good it is. It’s VERY regional.THEY DO NOT sell it in Tennessee. Shelby N.C. has a Livermush festival every October and proclaims it the perfect food, it also has 3 facebook pages, really, look it up. Its made out of pigs liver and cornmeal and spices, Yes that sounds pretty bad, but when you grow up on it you seriously crave it for your entire life. Its sorta’ the food of the Southern “North Carolina” Gods. I’m waiting for some hot shot Chef from the South to make it famous, then I will be investing in some Livermush futures. One of the other great foods from the south is Fried Green Tomatoes. Made famous across the nation by the book, Fried Green Tomatoes and The Whistle Stop Cafe, by Fannie Flagg and the following movie which spread the word further about the absolute deliciousness of those hard green balls of tangy delight once floured and fried. The first time I made them for my husband back when he was just a boyfriend, he said he didn’t want any as he didn’t like tomatoes. I said well he could try it, but Nate (my son) and I could certainly eat his portion if he didn’t want it. I seem to recall him shoving those hot little morsels into his greedy little mid-western mouth once he had tasted how good they were. If you want to do them right you CANNOT deepfry them, it has to be done in a skillet, hopefully an iron one with Crisco and butter melted to about a quarter inch deep and heated to a med high temp. I also serve them with tomato gravy, that is a recent addition, but as I have said often, Gravy makes every thing better. This is truly the food of the Southern Gods and here is the recipe. Oh yeah, just in case you are wondering, Southern Gods generally do not eat low fat. This is what all you will need for the gravy. 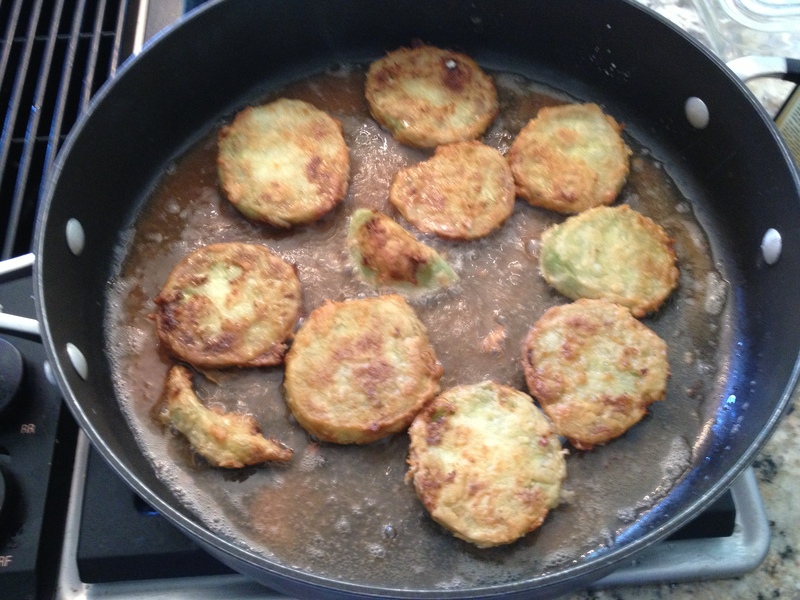 I make it first, as fried green tomatoes are best served fresh right out of the skillet, so you want everything else done before you fry them, they will NOT hold. And this gravy is really good on cheese grits too. Obviously double this if you are cooking for more than 2 people. This is what you need for the fried tomatoes. Slice the tomatoes to about 1/4 to 1/3 in thick, salt them a little and put in a big bowl, pour in buttermilk to cover. Add the spices and salt to the flour on the plate and mix well. TASTE it. If its not spicy and salty enough, add more, this is what your tomatoes will taste like when they come out. If you salt and pepper it when you cook it, it tasted SEASONED, if you do it after it just tastes salted and peppered. fixing to eat fried green tomatoes and tomato gravy! Enjoy the food of the Southern Gods. This entry was posted in SOUTHERN FOOD, Uncategorized and tagged Gravy, Southern Foods, Southern living. Bookmark the permalink. What a lovely treat tonight. Thank you for sharing your stories and recipes! This recipe brings back such wonderful memories of our mountain vacation with you and fried tomatoes straight out of the pan. Oh damn, woman, how I wish you could fix a plate of these for me. 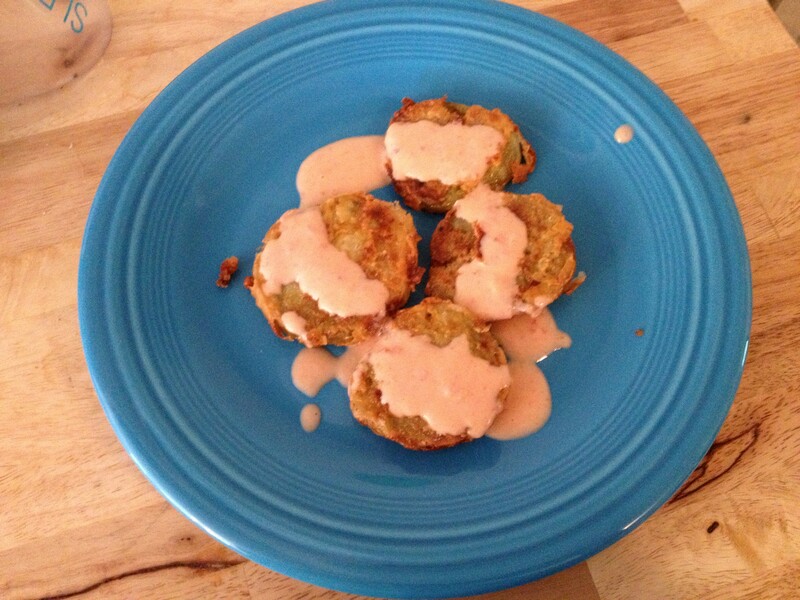 Because, come to think of it, for all the amazing things you’ve made me, you have never fed me fried green tomatoes! Biscuits, yes, menter cheese, yes, marshmallow toast, yes, but never fried tomatoes. Must rectify this situation soon. Can I just say what a comfort to find someone that truly understands what they’re discussing online. to light and make it important. More and more people really need to check this out and understand this side of your story.